Trying To Sell Your Haunted House? Every house has a history, but what if the house you are trying to sell has a history that is a bit more, er, ghoulish than most? If you or your community believes a house is haunted, it can make selling it a bit more challenging. However, there are several options for someone with a spooky property to sell. Just follow a few simple steps to get the haunted house off your hands. The first thing you will want to establish is if you are required to inform potential buyers of their future paranormal roommates. To answer that, you will want to consult your Realtor about your state’s disclosure laws. In New Mexico, the law does not require that a seller disclose that their house might be haunted, however, if the seller were asked directly whether or not they knew if their house was haunted or if their house had a reputation for being haunted, they should answer honestly based on what they know, if they know anything. Even if you don’t have to disclose, it’s still a good idea to give your potential buyers a heads up. So there is a chance that your haunted house may even be a selling point. A survey from realtor.com (www.realtor.com/news/survey-most-people-open-to-buying-a-haunted-house/) revealed that 62 percent of respondents would or might consider buying a haunted house. “You can work with a Realtor to tap into that market inside or even outside of your community, perhaps marketing to clubs or organizations or even television shows with an interest in the supernatural” said Dailey. So what are some of the signs that your house may be haunted? If your property includes a grave site, perhaps there is a lingering spirit attachment to the house. If your house was built over 100 or 200 years ago, a lot more people have lived in the house, so there is a greater chance that your house could be haunted. If your house is near a historic battle site or location where there has been a disaster resulting in a death or numerous deaths, there could be remnants of paranormal activity around your house. Some of the signs that your house might be haunted include things like levitating objects (extreme), to things just being in places different from where you remember leaving them, to flickering lights, strange noises, or even the sensation of cold spots around your house. But if you can’t find an amateur paranormal investigator to buy your house, it might be time to lower the price. That same realtor.com survey mentioned earlier showed that nearly 1/3 of buyers would expect a haunted property to be discounted by up to 30 percent. Your Realtor can help you figure out how much to discount your house from its “non-stigmatized” neighboring houses values. 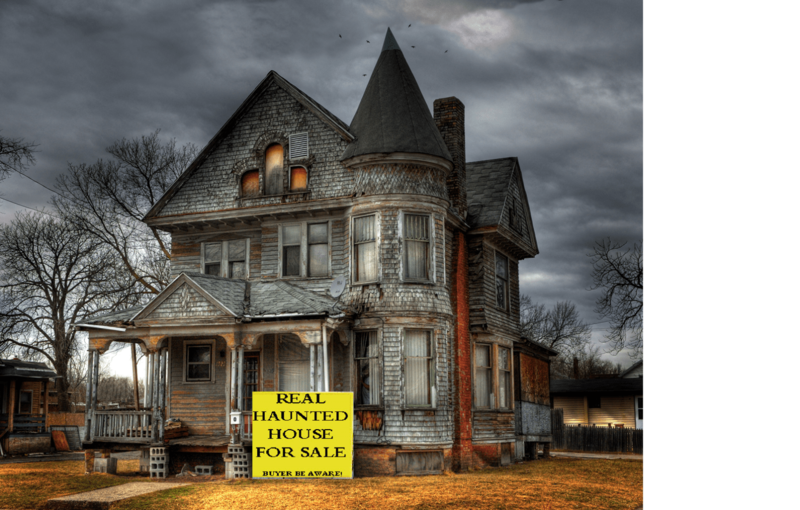 Home » Ghosts in the news » Haunted » Trying To Sell Your Haunted House?